Blues: Today he who has crushed the heads of the dragons in the water bows his head to the Forerunner in his love for mankind. Greens: Christ sanctifies with holy baptism his church of the Gentiles. I indeed baptise you with water unto repentance: but he that cometh after me is mightier than I, whose shoes I am not worthy to bear: he shall baptise you with the Holy Ghost, and with fire: Whose fan is in his hand, and he will thoroughly purge his floor, and gather his wheat into the garner; but he will burn up the chaff with unquenchable fire. Χριστὸς καθαρθεὶς ἐν ῥοαῖς Ἰορδάνου. by those streams cleanses our filthy nature.Hörandner, "Ein Zyklus von Epigrammen zu Darstellungen von Herrenfesten und Wunderszenen," 108.
καὶ πνεῦμα θεῖον ὡς περιστερὰν ἴδῃς. Baptist, don't fear to touch the fire! and you will see the Holy Spirit in the form of a dove.Hörandner, "Epigrams on the Lord's Feasts," 118 and 120. BZS.1955.1.2842. Depiction of John Prodromos. In the cycle of Great Feasts, Christ's baptism was commemorated at Epiphany (6 January). Together with the Nativity, Epiphany commemorated the great mystery of salvation. Also known as ta theophania, it is linked with the theophanies of the Hypapante and the Transfiguration.ODB 1:715. 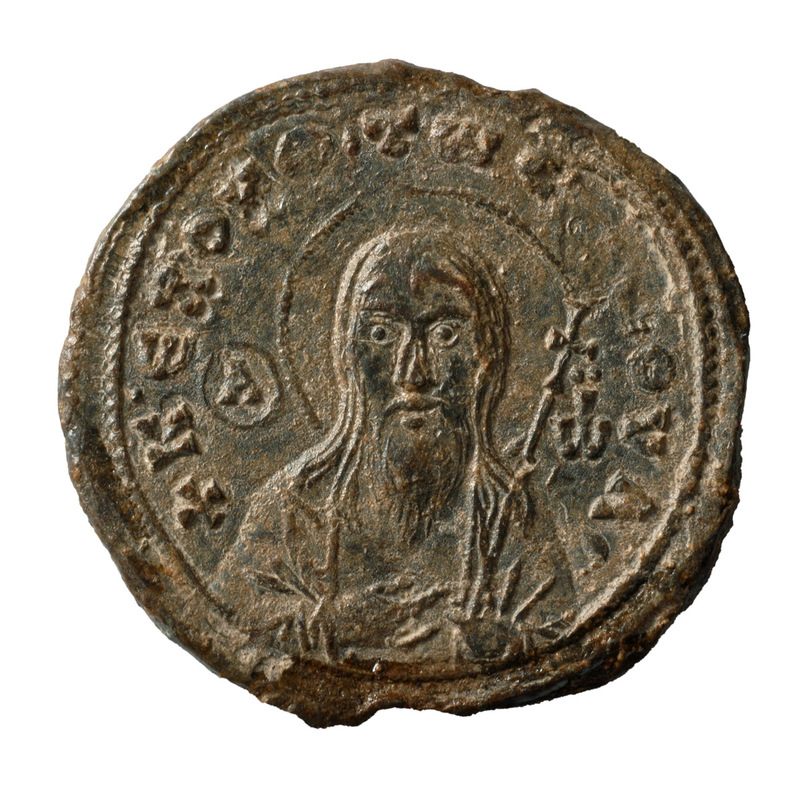 The Baptism of Jesus appears on six seals dating to the sixth to twelfth centuries. This is a rare example of a scene that was more popular before the Iconoclast era than afterwards. Over time the scene evolved: before the period of iconoclasm we see a simplified version, pared back to its essential components, John that Baptist, Jesus and the River Jordan. From the eleventh century the scene becomes more complex with the addition of the Holy Spirit in the form of a dove, flying towards Jesus, and two angels on the river bank, one of whom holds a garment out towards Christ. This latter design corresponds with the decorations found in Byzantine churches from the eleventh century onward. This example displays the Baptism scene on one side, and a standing St. John the Baptist on the other.